In a medium sauté pan, heat the olive oil over medium high heat. Add the kale and sauté just until wilted, 2-3 minutes. Remove from heat. Place the kale in a mesh strainer or colander and allow to drain while you prep the rest of the ingredients. Place the bread on a sheet pan and toast 5-7 minutes or until it is starting to get crispy but not brown. Remove from oven and set aside. 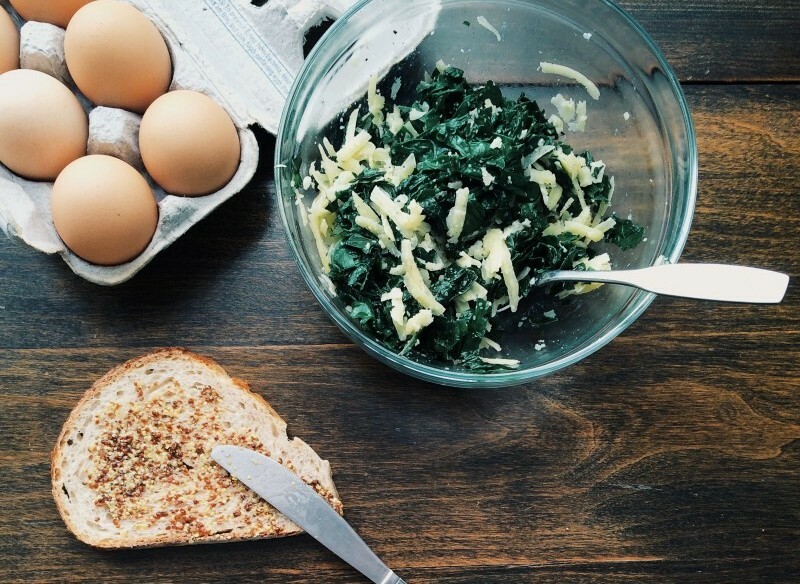 While the bread is toasting, place the cheese, milk, and kale in a medium bowl. Season to taste with salt and pepper and mix to combine. Coat each slice of toast with 1 tsp. mustard and top with 1/4 of the kale mixture. Return to the oven for 10 minutes or until the cheese is melted and slightly brown. Heat the butter in a medium skillet over medium-low heat. Crack the eggs into the pan, add a few drops of water and cover. Cook for 1-2 minutes depending on how set you want the yolk. Remove from pan immediately and place one egg on top of each tartine. Shred or grate potatoes in a food processor or with a cheese grater. Place in a large bowl with salted cold water. Let them soak for at least 15 minutes, and up to an hour. Slice the onion into thin strips, and finely chop the kale. Drain the potatoes well, or spread out on a clean cloth and pat dry. Combine all ingredients in a large bowl. Coat the bottom of a heavy skillet in about 1/4 inch of oil and heat on medium-high heat, but do not let it smoke. Add spoonfuls of the potato mixture to the hot oil and fry on both sides until golden brown. Place on absorbent paper towel to cool. Puree all ingredients in a blender or food processor until smooth and thick. Add a little water if necessary. *To make the roasted peppers and onions, remove stems and seeds from sweet peppers, then slice. Toss together with sliced yellow onion, a little oil and season with salt. Bake at 375 degrees until the peppers and onions have browned on the tips. In a large mixing bowl, combine the dry ingredients. Set aside. In a medium mixing bowl, combine the eggs, maple syrup, apple sauce, and almond milk. Pour the wet ingredients into the bowl with the dry ingredients. Add the grated zucchini and stir until fairly even-textured. Add the almond extract and stir to combine. Line muffin tin with parchment muffin liners, or coat with oil or cooking spray. Fill muffin tin with batter. Bake for 25 minutes for mini muffins, or 30-40 minutes for large muffins. They are fully cooked when a toothpick or bamboo skewer comes out clean. Let cool on a cooling rack before serving. Cool completely before freezing. Makes about 5 dozen mini muffins, or 30 large muffins.